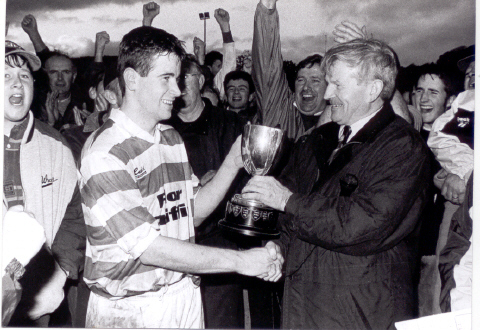 October 11th 1997 @ Ballinhassig..
Amidst scenes of great joy at Ballinhassig on Saturday last, Courcey Rovers were crowned South East Junior 'A' Irish Permanent football champions, when they deservedly defeated Kinsale in their replayed final. In the presence of another big attendance, Courceys made history by winning the top prize of Carrigdhoun football for the first time and also completed the great double of Junior 'A' Hurling and Football titles for 1997. 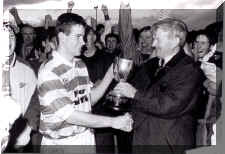 And for young Seamus Hurley, who lined out at right corner forward on Saturday last, it marked an unique achievement and a record which is unlikely to be broken in that he was winning his fourth South East Championship of '97 having already been a member of the club's minor, U21 and junior hurling victorious teams. At short notice, the Ballinhassig club had their grounds in readiness for the occasion, after the Innishannon venue was deemed unplayable, and following the ceremonial team parade, led by the Carrigaline Pipe Band, the hugely enthusiastic crowd on the bank got behind their respective teams, and while this contest was not as exciting as the drawn game, nevertheless the atmosphere was electric throughout. However, after a trouble-free first half, the atmosphere on the pitch changed in the 50th minute when Kinsale's Liam O'Riordan, who had made such a valuable contribution to his side's recovery in the drawn game, was sent to the line for an off-the-ball incident, which resulted in two Courcey Rovers players being 'downed'. And then five minutes later, a melee broke out involving players and officals, all of which cast a sad shadow over this sporting scene. Kinsale aided by the wind, got off to a superb start and inside the first minute Jeremy O'Donovan had converted a 20m free. Bye the fifth minute Humphrey Moynihan, gathering smartly from a Padraig Buckley free, added another before Seamus Twomey opened the Courceys account, following good work by John Murphy. But with Linden Kiely, Niall Buckley and Brian Murphy excelling in defence and Jeremy O'Donovan on top at midfield -- he added two great points from 45m frees from both flanks by the tenth minute -- Kinsale were sailing nicely with a 0-4 to 0-1 lead. And undoubtedly the score of the match came in the 15th minute with Humphrey Moynihan's all-in-one act of a block-down and hold of Michael Roche's attempted clearance in front of the posts, and then in two minutes later, in the 17th minute, when Liam O'Riordan pointed his side 0-6 to 0-1 ahead, it was to mark a significant sign for Kinsale and their inability to score again for the remaining 43 minutes of the game. And again, as in all og their games on the path to the final, Kinsale could not find the net, and for the remainder of the half their forwards, except for Cormac Fitzgerald, who was closely guarded ,unfairly at times, by his marker Liam Twomey, Humphrey Moynihan and Liam O'Riordan could never really penetrate a very solid Courcey defence in which Niall O'Donoghue, Gary Maloney and Brian Downing never put a foot wrong. And no doubt Courceys' control of that second quarter was managed by their magnificent midfield duo of Seamus Twomey and John Murphy, who between them kept a stranglehold on the situation, and while the winners did not register further scores, they kept the margin manageable as they retired 0-6 to 0-1 in arrears, but with the advantage of the wind and terrain in the second half. As in the drawn game, Courcey Rovers re-emerged from the dressing rooms in full flight and after one minute John Murphy kicked a resounding 50m free from the hands over the bar. After both sides had kicked wides, Declan Murray pointed in the 36th minute, after Brian Hayes had gathered from a short kickout. as corner back Niall O'Donoghue cleared to the waiting John Murphy and from his delivery down the right wing, Connie O'Regan gained possession and shaking off his marker at the edge of the square, he nestled the ball inside the left upright to level the score at 1-3 to 0-6. And in the space of two minutes Murphy and O'Regan were again involved as they set up substitute Jamie Hayes for the lead for the first time in the game, Now firing on all cylinders, the new champions began to seal their name on the roll of honour. The ever lively Charlie White continued to claim valuable possession and resulting from his unselfish distribution, set up the sharp-shooting John Murphy for a brace of points, which left Kinsale in a bewildered state and their game plan virtually in disarray. With Downing in control of the winners defence, they went 1-7 to 0-6 clear at 48 minutes, as free-taker Declan Murray obliged, and after Kinsale had been reduced to fourteen players, the Courcey captain added two more points, with five minutes of ordinary time remaining. Kinsale: K.Allen, L.Kiely, N.Buckely, B.Murphy,(DD) B.Murphy(town), K.O'Regan, P.Buckely, J.ODonovan, P.Forde, N.O'Sullivan, L.O'Riordan, C.Fitzgerald, H.Moynihan, P.Murphy, K.Cahill. Subs: G. Condon, B.O'Regan. Back Row L to R: Michael Murray, Charlie White, Sean Hayes, Seamus Hurley, Brian Downing, Seamus Twomey, Johnny O'Mahony, Liam Twomey, Michael Roche, Connie O'Regan, Brian Hayes, Niall O'Donoghue. 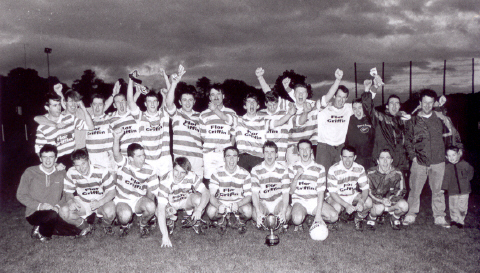 Front Row L to R: John Galvin, Shane O'Regan, John Roche, Anto Hegarty, Gary Maloney, Declan Murray (C), John Murphy, Brian Hayes, Jamie Hayes, Neilus Murray.